(Olympia, Washington) — It’s noon on Thursday — seven days until the 2016 legislative session comes to a close — and nothing’s happening. That’s how Summit Sierra charter school students said they felt as they walked around the now too familiar labyrinth of Olympia legislative offices to meet with legislators again and deliver hand-written messages. Ninth-graders Edgiemeh Dela Cruz and Clio Hasegawa slowly opened the door to the office shared by Reps. Roger Goodman, D-Kirkland and Jeff Morris, D-Mount Vernon, and handed a letter to an assistant. He was familiar with the students’ cause. After all, they had called 10 times the evening before in a phone-a-thon that included their parents and members of the East African community. The assistant said he’d pass on the message. They thanked him and left the office. As she walked down the hallway, Cruz gave the air a double fist bump. It was just one of the hundreds — if not thousands — of interactions charter supporters have had with legislators in the last two months, but the students are relentlessly hopeful. The House was in session that morning and the students paused on the balcony overlooking the adults who hold their fate. There was no lack of action 100 feet below them, just none of it relating to the state’s eight charter schools whose life span is shortening with each passing day. 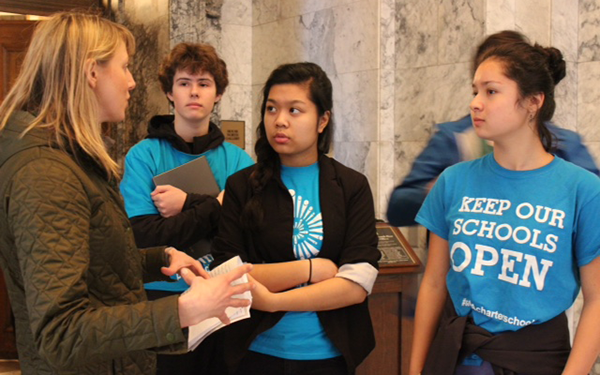 “What happens if nothing happens?” Hasegawa asked Maggie Meyers, the Washington State Charter Schools Association spokeswoman accompanying the student group. “– so other schools can open,” finished ninth-grader Clark Brace. The state’s charter school students may be experts in civic engagement at this point in the academic year. Since the state Supreme Court ruled charters unconstitutional in September, the schools and their 1,100 students have been fighting for their existence. 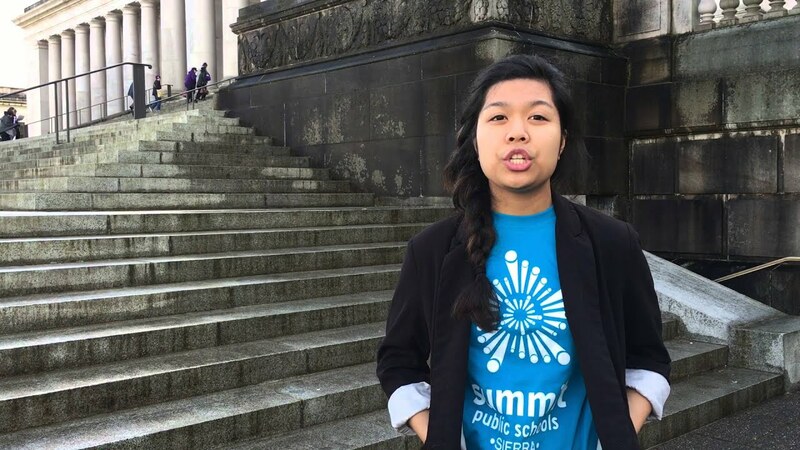 Backed by the well-funded charter coalition Act Now for Washington Students, students have made multiple trips to Olympia to rally, testify in committee hearings, hand letters to legislators, and sit down with their representatives. 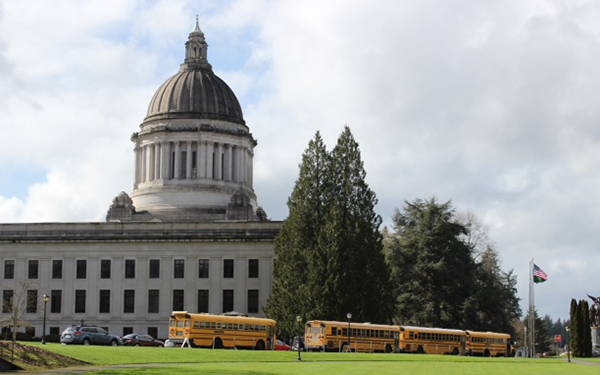 Some parents have been driving to Olympia daily since January— with many more joining their ranks this week as the urgency amped up — to ask that the charter law, passed by the voters in 2012, be reinstated. The coalition’s aired TV ads and educators have flown across the state to testify in Senate and House hearings. Over the past few months, students have shared how their charter schools offer personalized learning, how the small classes and teachers encourage their growth, how their schools have inspired them for the first time to dream about college. More than two-thirds of Washington state charter school students are from low-income families and more than 70 percent are students of color, according to Act Now. Mid-year data released by the state charter association shows the students making significant academic gains and the schools closing the achievement gap between African American, Native American and Latino students and their white peers. A charter bill introduced and passed in the Senate in January sought to fix this by taking money for charters from the Opportunity Pathways Account which is funded by lottery revenues. The House Education Committee refused to vote on this bill at its last meeting. Rep. Larry Springer, D-Kirkland, has since proposed a new title-only bill that aims to address how charter schools are governed. It’s difficult to tell what level of lobbying and behind-the-scenes negotiations may be going on in the final days around the charter issue. And while the Olympia hallways Thursday buzzed with student groups and the chambers echoed with legislator voices, news on all these charter school bills has been nonexistent since last week. 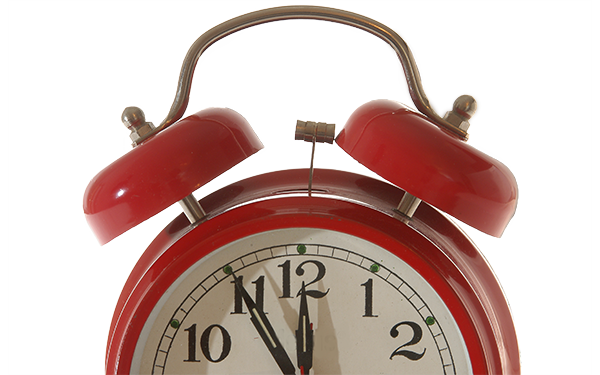 Yet even with a fast-approaching deadline, charter advocates stay hopeful that a long-term solution is on the horizon. 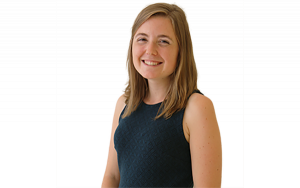 Rather than being cynical about the political process, some students seem energized by it. “What better way to get engaged?” said ninth-grader Alli Lapchis as she ate lunch with a group of Summit Sierra students enrolled in their school’s civic engagement class. Her classmate Tatiana Villegas thinks this experience has taught students how to be informed citizens, which will help when the day comes for them to vote. They drop their chip bags and jump up when it’s time for their meeting with Rep. Ruth Kagi, D-Seattle. The group of four want to go by themselves, they tell their parent supervisor. They think their message will be more powerful coming from just the students. While some students are enthusiastic about the process, others see the absurdity of having to fight for a good education. There’s an irony in students fighting for their schools in a nation that can’t say enough about the importance of a good education. The schools aren’t looking for a short-term fix to the problem, Meyers said. After all, parents won’t send their students to schools for one year intervals and it’s straining for teachers to have jobs hanging in limbo. Most ninth-graders aren’t thinking about where and how they will collect their high school diploma, but Summit Sierra students can’t get graduation off their mind. They say they want to receive their diploma from the school that embraced them freshman year, the school that inspired them to pursue college. So they trek through the stone legislative hallways again, pausing briefly to take a selfie with the brass bust of George Washington.